This week I invite you to imagine that instead of being set in New York City, America, the television series Mad Men was instead set in Glasgow, UK. Suave protagonist Don Draper would work on Sauchiehall Street instead of Madison Avenue, he’d handle accounts for Baxter’s soup rather than Heinz, and he’d drink Scotch instead of, erm, Scotch. All right, so this hypothetical comparator has clearly broken down, but of one thing I am sure. 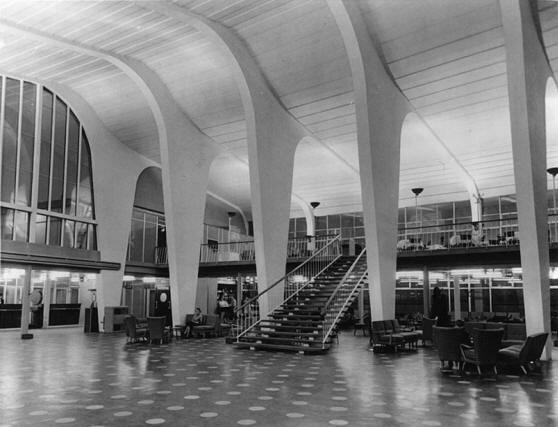 Instead of flying from the TWA Flight Center – all cool modernist/futurist curves and huge windows, he’d fly from Glasgow’s airport – all cool modernist/futurist curves and huge windows. Frequenters of Glasgow Airport might at this point be wondering what I’m talking about; because Glasgow Airport is not, to be honest, all that architecturally inspiring. The reason for any confusion is because I’m talking about Glasgow’s original and best airport: Renfrew. The terminal building at Glasgow’s Renfrew Municipal Airport is a lost beauty, available to enjoy now only through photos. It was a design years ahead of its time, and yet apparently almost forgotten today. 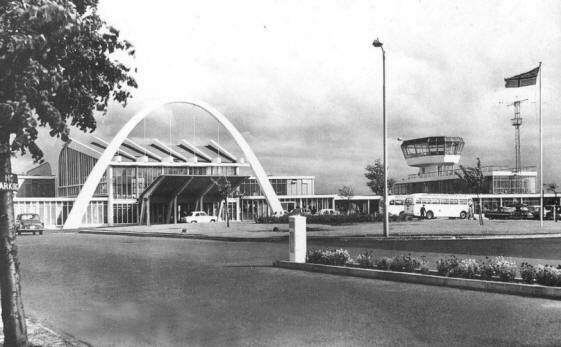 Renfrew Airport’s terminal building was the work of Scottish Modernist architect William Kininmonth, opening its doors (well, a single revolving door in fact) in 1954; a full eight years before the TWA Flight Center was built. I doubt Glasgow had had a shock like it since Charles Rennie Mackintosh’s Glasgow School of Art opened for business 55 years earlier. There’s something about Glasgow that’s placed it on the cutting edge of architecture several times, a grand tradition it is carrying on with Zaha Hadid’s new Riverside Transport Museum, which this blog looked at recently. The terminal building at Renfrew Airport. From Renfrew Aviation, by James Reilly, on www.myrenfrew.com, where there are other pictures of the terminal building, both inside and out. Inside the terminal building. From Renfrew Aviation, by James Reilly, on http://www.myrenfrew.com, where there are other pictures of the terminal building, both inside and out. 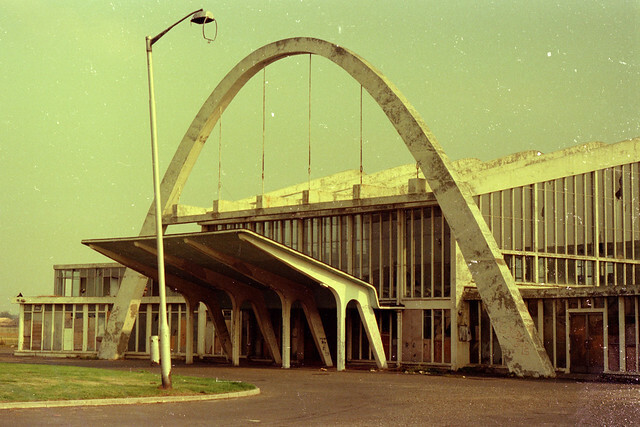 The curved roof was partly supported on sculptural pillars, and partly suspended from the hyperbolic arch at the main entrance to the terminal building. Inside, most surfaces were white, lit by daylight through the huge windows, while at night the ceiling was illuminated by stylish uplighters. The floor was polished and dark-coloured (I wish I knew what colour it actually was, but I suspect very dark grey with lighter grey or brown circles) and must have set off the white elements beautifully. And look at the floaty open staircase. Just gorgeous. Renfrew Airport (and its terminal building) was a victim of being a pioneer. No-one could have appreciated just how popular air travel would become, and by the 1960s it was clear that the terminal was too small to handle the number of passengers who wanted to fly in and out of Glasgow. It closed in 1966, replaced by the present Glasgow Airport built just a few hundred metres to the west. Renfrew Airport’s beautiful terminal building was bulldozed, and the M8 motorway was built over its runway. Ready to see something sad? UK airport railway stations are generally pretty dismal. Don’t believe me? I direct you to (a) Gatwick Airport station (monstrosity), (b) Heathrow Airport Terminal 5 station (buried in the basement of the disappointing Terminal 5 building, and feels miles away from the actual entrance to the terminal), (c) Southampton Airport Parkway station (the third word in the name gives that one away), or (d) Stansted Airport station (another one in a concrete cellar). Manchester Airport station is much more succesful, I’ll admit, but the new Glasgow Airport railway station looked set to steal the crown (from a pretty low base, I grant you). Glasgow Airport was not (and, I’m afraid, is not) connected to the national railway network, and in the early 2000s the Glasgow Airport Rail Link (GARL) project was developed, with the Scottish Parliament passing the GARL bill in 2006 to authorise construction. The plan was this…build a mile-long branch line off the existing Inverclyde railway line with a bridge over the M8, and run four trains an hour between a new platform at Glasgow Central station and a new station at the Airport itself. It was a scheme that attracted controversy though, because the new line to the Airport, which was planned to be elevated, ran across playing fields on the way. However, the elevated approach meant that the new station would be above ground, avoiding the Stansted/Heathrow ‘station in a cellar’ situation, and allowing for some rather exciting designs for the planned station. Architecture practice Austin-Smith:Lord developed the plans for the Glasgow Airport Rail Link (details on the practice’s website here), and this was the planned station. Austin-Smith:Lord’s design for Glasgow Airport station. As featured on their website here. Now that’s impressive. Austin-Smith:Lord knows what it’s doing – the practice was also responsible for Manchester Airport station. Unfortunately, in 2009 the Scottish Government, which had been re-elected in the meantime with a different political complexion, pulled the plug on the GARL project, worried about rising costs and potential further cost over-runs. This was despite the fact that additional track for GARL trains had already been laid near the planned junction with the Glasgow Airport branch line, and a new platform had been constructed at Glasgow Central. To get some small sense of what Glasgow Airport station would have been like, it is possible to visit Blackburn station in Lancashire, to see Austin-Smith:Lord’s earlier work on an attractive new curved glass canopy for platform 4. It is recognisably a forerunner of the wrap-over roof for Glasgow Airport, though a lot smaller. But that is as close, I fear, as we will ever get to standing on a railway station platform at Glasgow Airport. A friend suggested I take a look at Renfrew Airport terminal (thank you!) for inclusion on this blog. So I did, and I did. I like getting suggestions and recommendations. If there’s something you think I should be covering on the beauty of transport, drop me a line: see the “contact the author” tab.